Video 1 (A) – The 3 Types of keywords you should Use and Why! Video 5 (E) – Lost For Ideas on Keywords? Two Methods On Finding Keywords and How To Test Them! Video 1 (A) – The Pre-Upload Musts! Video 2 (B) – The 6 Upload Musts! Video 9 – Paid Views Got Me Ranked, Subscribers, and Email Leads! Video 8 – How To Streamline It and speed Up The Process! Extra Module #3 – Live Challenges, Case Studies, Test Results….oh my! Does A Strong Channel Really Matter? Below you will find all the tools and products I use, recommend, and some of them I was able to get you a discount on! Unique Article Wizard is one of the most powerful backlinking tool I use and it proves time and time again to hold so much power for ranking videos. We use it to build backlinks to our backlinks, backlinks to our videos, to get you video embed on relevant content and to get a wide range of backlink keyword variation. It even drip feed your backlinks! 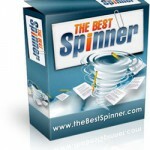 The Best Spinner is a tool I use to speed up the process of Unique Article Wizard. Is it necessary? No, but it GREATLY speeds up the process because it you use high quality spun article you can have great articles to use in Unique Article Wizard in seconds. Long Tail Pro is the best keyword tool that I use to find keywords for my video, look up the competition and analyze how hard it will be to rank a video. It do not need this tool, but it really helps me out so I wanted to list it anyways. This is the SUPER tool to get real social indicators! I use it to help my video spread virally in a lot of my videos. Yes, it takes time to set up but when you do it will totally rock! I use videohive to find a ton of video elements, video intros and other things to use in my videos. If you want profession video elements that you can use in your videos you NEED to check out videohive. This is, hands down, the best place to get music for your videos! There isn’t much to say about this…it’s just awesome. This is where I get almost all my sound effects for my videos. They even have some free music files as well. Everything on this site is completely free! Have fun! Like I mentioned, you don’t need to use Long Tail Pro and if you don’t want to you can use the Google Keyword Tool. It is great for look up search volume and terrible at giving you the competition….but with video the competition is not all that important. This is a free tool showing you how many shares you and your competition have! Pretty useful tool I plan on using a lot more in the future.